The good news is that without those things you can still have your own outdoor pizza oven with a regular gas grill and either a BakerStone or KettlePizza accessory. They produce the same effect, but are pretty different products. So I bought both the BakerStone and the KettlePizza, and tried them on my grill to see what the results were. 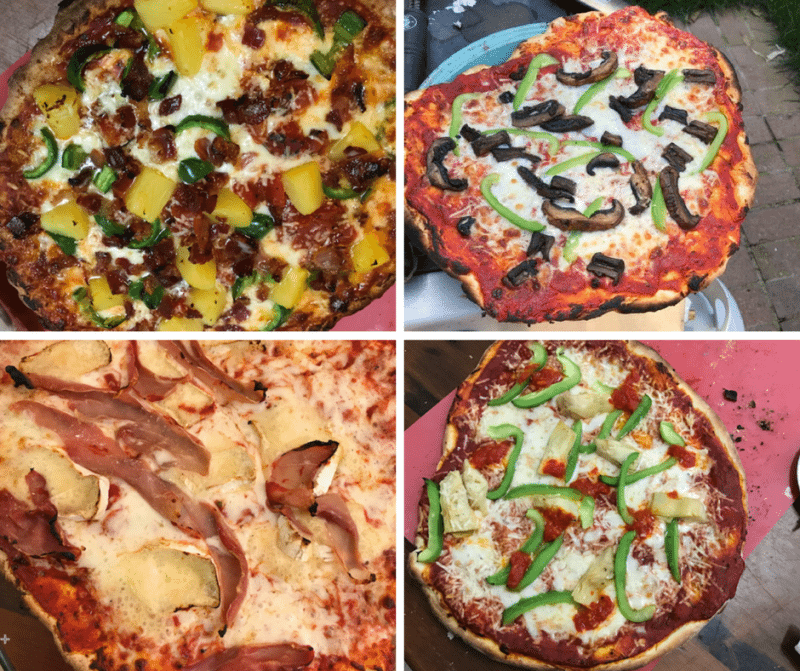 In this review I'm going to do a mini-review of each of these pizza-making product, then compare their attributes (size, weight, features), my personal cooking experience with each, as well as talk a bit about the pizza that was produced. Spoiler: they are both good products. Which one you end up buying will depend on what features you think are most important. I'll talk about that at the end of the article. Note: I own a standard 3-burner gas grill, and both of these devices fit perfectly for this type of grill. They will also work on larger grills. It would be very cool to cook pizzas on one side and something else on the other side! BakerStone makes a beautiful product. The Pizza Oven Box has a very “finished”, i.e. sleek design that makes it look like a serious piece of outdoor pizza cooking equipment. I was actually surprised that it only costs a little more than a hundred dollars, since it looks like it might cost more than a couple hundred. Compared to outdoor brick pizza ovens or even gas pizza ovens that cost upwards of $1,000, that's a pretty good price. Unfortunately, this product requires some assembly. It's easy enough to put together, but it did take me about 20 minutes. I was very concerned about breaking the pizza stones, since you can't buy replacement stones in this shape, and you can't get a refund on stuff you break…even if it is an accident! I also put some parts on backwards the first time around, so had to redo it. In the assembly process, I learned that there's a small space in the back of the box. I assume this is for air flow, but it also makes scraping out lost toppings or burnt stuff stuck to the pizza stone. There are upsides and downsides to the design of the Pizza Oven Box. Its closed design means that there's no wiggle room. You can't lift the lid, or move the stone, or shake your peel very much to slide the pizza in the oven. You've got to get the pizza in and out with a relatively flat angle to your peel. That means you need plenty of flour on your dough and on the peel to ensure it doesn't stick. Even then, you need a pretty strong forward motion to get the pizza in there. Of course I spread the olives out after the photo, but I just wanted to capture how crazy it was to show you guys. Anyway, the trouble was that with such a forceful forward motion from the peel a few of the olives flew off the pizza into the box or into the barbecue. It's not a big deal, but if you plan on loading up your pizzas with a ton of loose ingredients like meatballs, capers, or pepperoncini peppers maybe cover them with some cheese to weight them down. Just a thought. That was the downside. The upside of the design is that it's got a pretty wide mouth, so you can very easily get your pizza peel in and out, even with a loaded pizza. I found that the KettlePizza gas is pretty low, so that “mega supreme” pizza you've been thinking about making might not fit. The wide mouth to the BakerStone box also means it's possible to bake other things like bread, or even meats and veggies as long as they're in a separate container. I'm not sure why you would want to do that when you could just use an oven or grill them, but the possibility is there. The main appeal of this device is definitely making pizza, so I wouldn't worry too much about trying to cook other things with this. Pizza stones are meant to get dirty. There's going to be burnt flour, lost pizza toppings, and bubbled-over cheese that gets baked right onto your stone at 700 degrees. It's not coming off. Most of the time you can just get a metal scraper and scrape off the burnt-y stuff. Next time around, your pizza will taste just as good. In fact, it probably adds character to your outdoor pizza oven! But cleaning the BakerStone box is a little difficult. Because there's no lid to lift off, and you need to unscrew the back to disassemble the device, cleaning means reaching your hand into the box to scrape off the junk. Of course, you should only do this when the box is COLD. But still, you need the right type of scraping tool, at the right angle to get the really gunky stuff. It's just hard to do, if not impossible as you can see from the cheese and black blob in the photo above. My pizzas after this tasted fine, but it bugs me that I couldn't scrape this stuff out. With a separate pizza stone as with oven baking or with the KettlePizza, you can just get a flat scraper, grab the stone, and chip/scrape/dig however you want. If the stone gets dirty enough, just replace it. I just finished writing up the full review of the BakerStone Pizza Oven Box, updated with more details, more photos, and more insight into this product. The mini-reviews on this page should suffice to make a decision on which product to buy, but if you want to dig deeper, I've done individual reviews for both devices. Video: The owner of BakerStone showcases his product! *Note: There is currently a differentBakerStone Box available on Amazon which is significantly cheaper. However, it's listed incorrectly. It's the smaller version which fits on a 2-burner grill! I don't recommend that one. The link above is to the standard size oven. The KettlePizza gas came in a very unassuming box. It was basically a couple sheets of cardboard without any type of label. Maybe that was just the seller on Amazon, but I was pretty surprised there was so little fanfare for such a neat device. The design of KettlePizza Gas is pretty smart. It's a single sheet of steel shaped to rest on your standard 3-burner grill. From the photo above you can see that it fits perfectly! I tried this one first because it was so simple to get started. Instructions? Don't need 'em. All you need to do is attach the thermometer with wing nut (included) and you're good to go. Place your pizza stone (also included) on the grill, then put the KettlePizza on top. 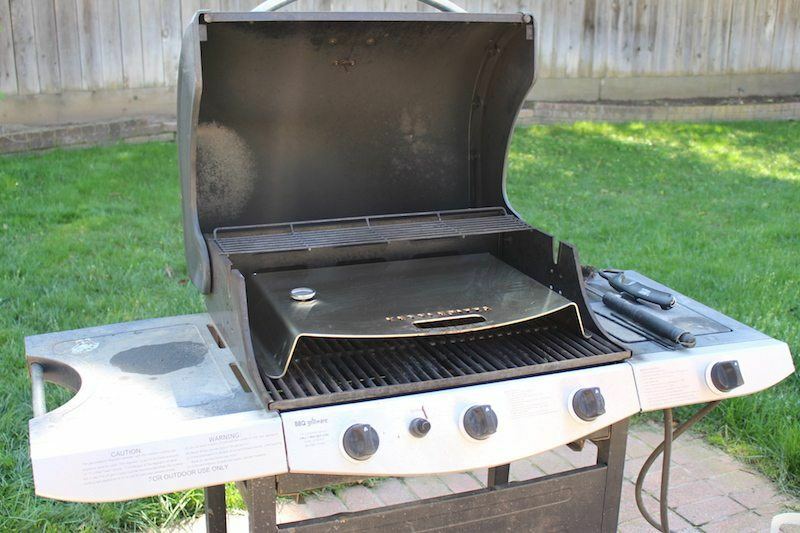 My grill is super old, and the igniter doesn't work so I have to manually light the burners first, but if your grill still works properly you can start your grill at this point, close the lid, and get things heating up to 700ºF. It only takes a few minutes. I'm going to do a time test in the near future and publish it on my full KettlePizza Gas Pro review when it's done. Regardless of the exact time, it takes only a few minutes, and it's faster than the BakerStone. In this photo I'm actually making some flatbread. I baked 10 pizza in 5 days for my BakerStone VS KettlePizza testing so was sick of cheese and pizza sauce. All I did was take pizza dough, flatten it out, and top with salt, pepper, and olive oil. It was delicious, of course. But you can see from the photo that the edges are a bit burnt. I found that with the KettlePizza it seems to get super hot near the back. You do need to turn your pizza once or twice during cooking. I also turned my pizza with the BakerStone Box, but that device took longer to cook so it was more out of boredom and impatience. Definitely keep your eye on the grill if you're cooking at the max 700 degrees with the KettlePizza! Most of the time I was able to fully cook a pizza with just a two minutes on one side, then flip it around two minutes on the other side (approximately). Time will vary based on your dough thickness and pizza toppings! Cleanup is super easy. Just wait your KettlePizza to cool, then remove from the grill and store it somewhere out of the way. It's very sturdy, thick metal so won't be harmed by much except maybe rain. You could probably just leave it in the grill if you want! 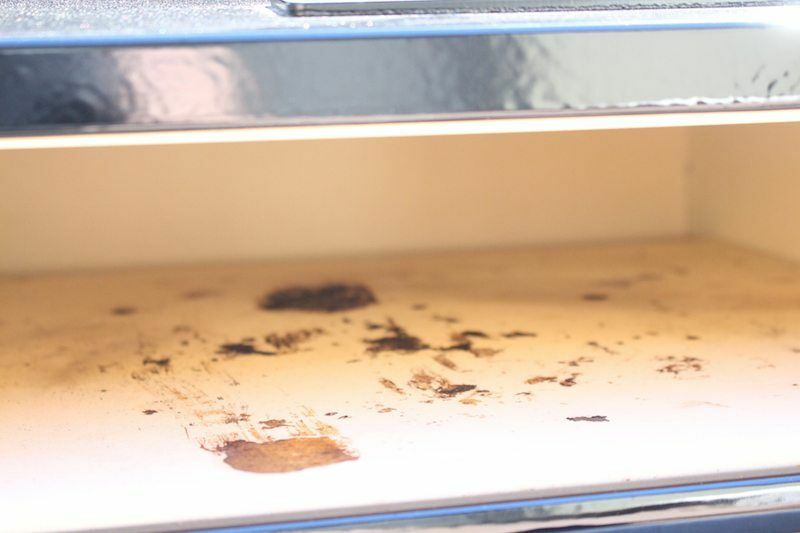 The pizza stone can be removed and you can scrape off any gunk and throw it in the oven for easy storage. With Amazon, you get free shipping through Amazon Prime. You may also get 5% cash back on your order if you have an Amazon credit card. That's a potential discount for you! Buying from KettlePizza.com gives you more choices for options. You can clearly what packages are listed by price and products included. This makes it easier to just order the parts you want as part of a package. You could mix ‘n match by ordering through Amazon if you want. That's what I did. I bought the Basic on Amazon, then bought my own pizza peel. I do recommend that you at least get their brand of Pizza Stone because its made for the barbecue. Other brands may crack under grilling conditions. Video: Watch Me Using the KettlePizza Gas! As mentioned above, the KettlePizza is slightly smaller than the BakerStone. This makes it easier to maneuver and store, but it also gives you less wiggle room for getting pizzas in and out of the oven. Though the BakerStone claims to have a higher heating temperature range, I found the KettlePizza to cook hotter (I burnt more pizzas!). With the lid down on the KettlePizza, it can cook a thin crust pie in just two minutes. I usually turn it just once to crisp the other side and then it's done. The ideal temperature for baking a pizza depends on the style you're making and the thickness of the crust, so don't get married to the idea that to have artisan pizzas, you need a 1000º chamber temperature like the wood-fired ovens from New York. The nice thing about KettlePizza is that you can see the actual temperature! 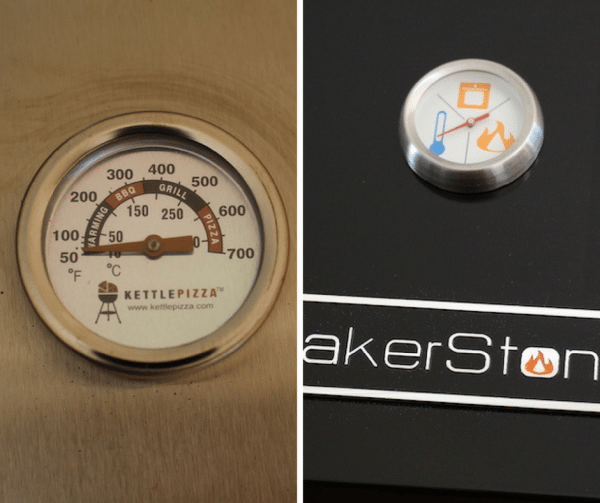 There's an actual number on the gauge so that you can measure, track, and improve your pizza making skills. With the BakerStone Box you have a nice graphic design to look at, but it's a little imprecise. You could get an infrared temperature gun, but that's just another piece of equipment you have to buy, store, and not lose. Getting started with KettlePizza Gas was much more fun. I just tossed it on the grill and started within a few minutes of receiving the item. I already had a boxed pizza ready to go on the day of arrival. Even after I started making my own dough I still had fun tossing around the the KP Gas because I didn't have to worry about damaging it at all. I tended to be more careful with the BakerStone. I was also concerned about getting cheese and toppings on the top of my BakerStone Box despite it having a wider opening. I guess I just didn't want to get something that looked nice dirty. I find the KettlePizza heats up faster, cooks pizzas faster, and is easier for me to precisely track temperature of my cooking. Honestly, I think I enjoy using the KettlePizza more than the BakerStone. Just make sure to turn your pizza in time. It'll burn faster at higher temperatures, and may not cook the middle all the way through if you are making thick dough. But you can also control the temperature by turning your gas grill up/down or leaving the lid on/off while cooking. Update: So I did some testing, and so far, when heated under the same conditions, they heat up pretty similarly. On a cold day (60ºF), with the lid open, both heated up to about 400-500 degrees in 20 minutes. After I got impatient, and closed the lid, they then achieved about 700 in less then 10 minutes. Although they were close, the KettlePizza was slightly hotter, and slightly faster. Coupled with the fact that you can just close the grill lid on the KettlePizza to achieve faster temperatures, KettlePizza wins here. I really haven't made enough pizzas to see if one makes better pizza than the other. I've tried so many dough recipes as well as pizza recipes over the past few weeks that I can't say that one performs better than the other. However there are two main things that happened that are worth mentioning. Of course, with enough practice, you an dial in either of these devices, but that's been my experience so far. Keep in mind, I'm constantly altering my dough recipes and improving my pizza making skills. The second picture (Bakerestone) pizzas tasted the best so far, but they are my most recent batch. I allowed the dough to rise for a full 24 hours before making them, and made much smaller pizzas. I think the flavor improvement has more to do with the dough preparation than the oven itself. So far, that's what I think. I'll continue to experiment and update as I get more data. We've got a whole summer to go! Who is BakerStone Best For? Firstly, BakerStone is cheaper so if price is your only concern is price, then this is the one to get. In terms of “the look”, BakerStone wins too. It simply looks nicer sitting on the grill. 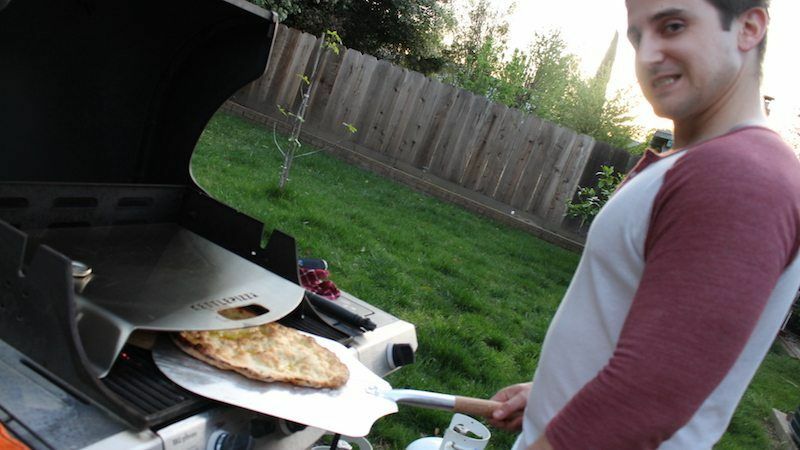 This outdoor pizza cooker is great for a casual barbecue guy that wants to cook pizzas from time to time but doesn't want to invest too much money into the hobby. Who is KettlePizza Best For? The KettlePizza cooks hotter and faster, so if you want to cook some rapid-fire pizzas for an backyard barbecue get-together, this is the one to get. In terms of storage, if you're hurting for space in the garage or kitchen, this device will be easier to put in a corner, or even store things on top of. You can store it portrait style or landscape style as well. Heating temperature is more precise as well, so if you imagine yourself experimenting to find the perfect temperature for your favorite dough, this is the way to go. This is best for someone that isn't ready to spend thousands of dollars on a wood-fired pizza oven, but still wants a badass piece of grilling equipment and wants to make the best pizza possible. Of course, the statements above about which backyard gas grill pizza cooker is best for what type of person are my best guesses based on my testing and feelings about each of the devices. When it comes down to my personal opinion on whether I prefer the BakerStone Pizza Oven Box or the KettlePizza Gas, it's a close call! I'm only going to be grilling few months out of the year, and even then, there's only so many opportunities to make pizza outdoors. I want to be able to store this device somewhere convenient, then wipe it down and get ready to go immediately when I'm ready. It heats up much faster too, so the entire process of pizza making goes a bit quicker. What can I say, I'm pretty impatient. I also want to be able to accurately see my cooking temperature without investing in an infrared temperature gun. I want to improve my pizza making skills over time, and part of that is being able to track variables like dough ingredients and cooking temperatures precisely. The KettlePizza Gas Pro is what I'll continue to use this summer, so it's my top recommendation for outdoor pizza barbecue devices (for gas grills). That being said, the Bakerstone Pizza Box is still a great choice, and is 1/2 the price, so it's a good option if you're on a budget. Have you used either of these devices? What was your experience and which one would you recommend? I don’t know. They both sound like they can make excellent pizza to me. 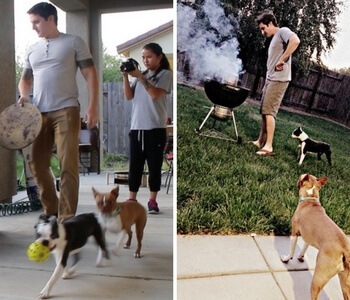 I want to get both of them if only I had a backyard to bake pizza with. That way, I can more pizza at once. Oh by the way, that is really a lot of olives. I can’t ever imagine myself eating that many olives at all. I guess your girlfriend is a health fanatic. Anyway, long story short. I like speed. Preferably I would probably choose kettle pizza grill simply because it heats up faster. I hate cooking too slowly. Thanks for the recommendations. LOL. It has nothing to do with being healthy…just really liking olives. The other day I made small pizzas and could only fit one can on the pizza…..so she just ate the whole other can. Pretty funny stuff. Then she complained there was too much cheese on the pizza. Is that possible?! You really don’t need to buy both. The quality of the pizza is similar enough that spending money just once is enough! After continuing to use the KettlePizza more, I really do appreciate having the ability to heat up the grill faster so I can start making pizza! The BakerStone Pizza Oven Box is totally amazing, and something I would definitely like to try. Here in New York, we only BBQ during the warmer months, and I don’t like to be limited to just chicken and fish — so this is a really cool addition to my BBQ repertoire…! 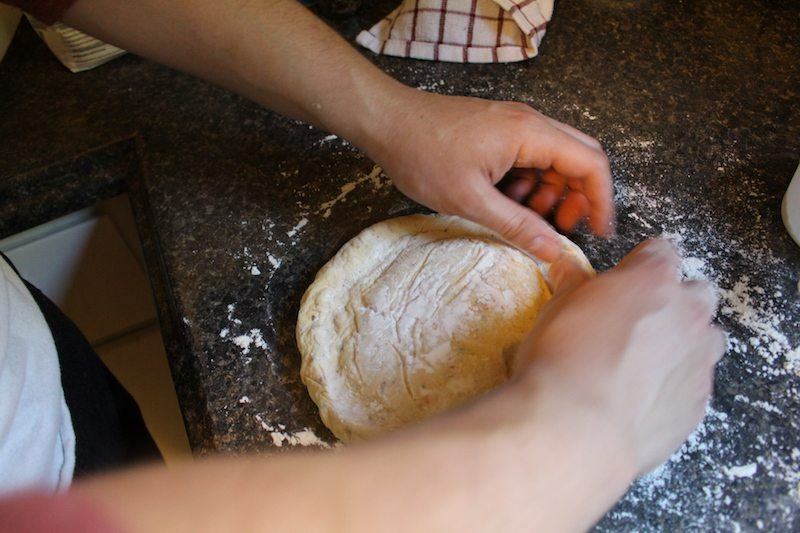 I am very intrigued about making my own dough as well — so delicious! I am going to bookmark your site, because I want to use some of the recipes as well…! I am telling my husband about these. I have never seen pizza making on a grill before. We love to make pizza and I love a good deal and now with the weather finally getting warm, I am excited to spend more time on our patio. Your website is very informational and I love the personal photos! I will let you know when we make our decision. With the weather getting warm, now is the time to start practicing your pizza making skills! This is a great way to keep the heat out of your kitchen and get everyone outdoors. If you have a really nice patio and enjoy looking out on your backyard then this is a perfect gift for someone (or yourself). Please let me know which one you end up getting. I know what my favorite is, but I’m curious to see what others prefer! Wow, you make a great case for both of these products! I really appreciate that you put pictures of them both here, because it makes a difference. I’m new to the gas grill, since we’ve only used charcoal so far, but we’re looking forward to joining the rest of the world with a gas grill sometime in the near future. I hope you’ll forgive a couple of questions from a real beginner here. First, it looks the the BakerStone is a real box, but the KettlePizza just sits on top of the grill sort of like a tent, is that right? In that case I can see why you’d need a stone for the KP, but not sure why you’d need one for BS. I have to say, I like the look of the BakerStone, and I wonder why it’s so much less expensive than the other one. I’m looking forward to experimenting! May your edges stop burning soon! You are correct – the bakerstone is a box, and the kettlepizza is just a “cap”. 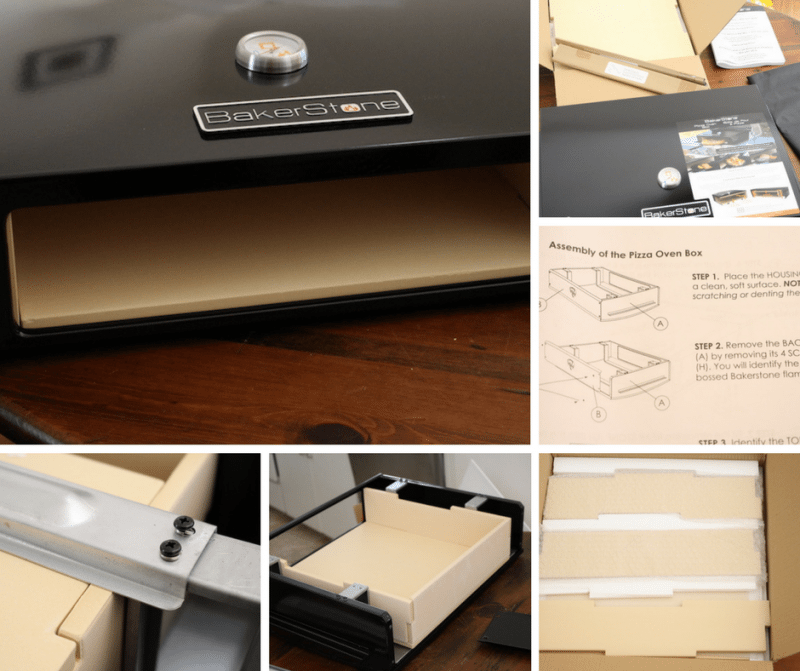 You don’t need pizza stone for the bakerstone box – the inside of the box is all “pizza stone” material. I’m also curious why the bakerstone is so much less expensive. But I think it’s because the material its made out of is much thinner than the kettlepizza. The Bakerstone box is very thin steel (although high quality! ), plus pizza stone. It’s only a pound heavier than the KettlePizza despite being larger. However the KettlePizza is a seriously thick solid piece of stainless steel. I’m sure the material itself is the cause for the cost, not necessarily the cost of manufacturing the item. Pizza is my food of choice hands down, but I’ve always been confined to a kitchen if I was to make it myself. This concept seems wonderful! I’m also sure that the taste/quality of the pizza would be significantly better and it urges me to try this out! Thank you! Very nice and educational article, very precise details on boths products. It really help people out there to know there is an easy way to do pizzas on the grill. I did like them both but if i have to pick one I will go for the Kettle Pizza it looks easier and convenient to use and i love the idea that you can buy a new replacement pizza stone if something happen to the one you have. Yeah, that was pretty much my thoughts too. They are close though! It’s nice that you have two diverse products to choose from, each with advantages depending on what type of outdoor pizza maker you’re looking for. I live in Phoenix where we can also grill year round. I had no idea either of these products existed! 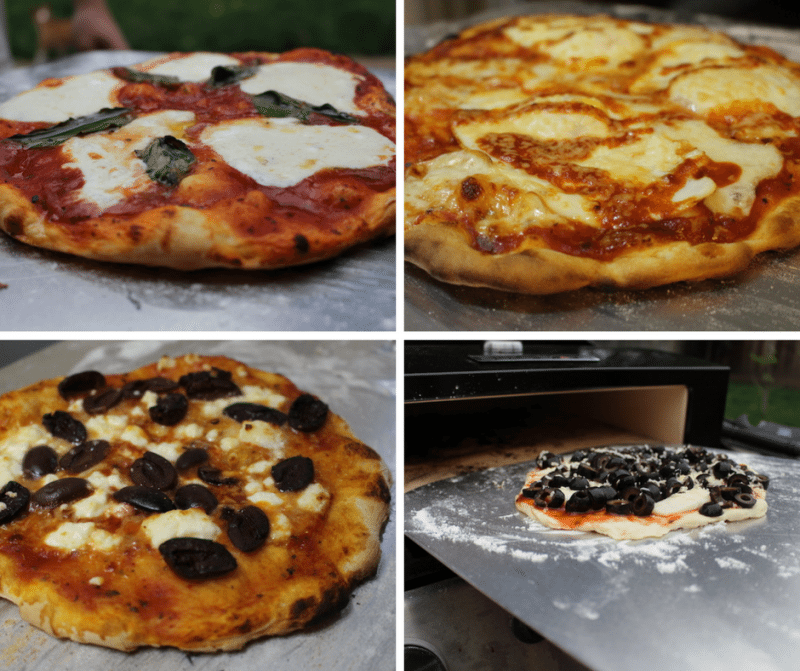 Your pictures of the pizzas you made make me want to go out and buy one right now. I think I would prefer the KettlePizza maker because I’m not good at putting things together, and the BakerStone assembly makes me nervous. I also get impatient waiting around for things to cook, so the quicker the better. Thanks for your thorough review and recommendations! Bakerstone assembly is easy enough, but I agree that the KettlePizza has the advantage in this category due to ease of just slapping it on the grill. I love grilling pizzas. We live in Arizona, so we grill year-round. We usually just throw the pizzas on the barbecue, and hope they don’t burn. I didn’t realize there was a product specifically for grilling pizzas, that can simulate a brick pizza oven. I really like the BakerStone. This is a fantastic idea. The pizzas look really good, and are probably not burnt on the bottom like mine usually are. It sounds like you can use them for other foods as well, which is great. We love to cook veggies on the grill also. This would be a great multi-use piece to have. Thanks for the great information. I will have to add this to my wishlist. BTW….The pile of olives is great! That’s exactly why I do these comparisons, and I’ve got a couple more on the way! I know that when picking a product you really want to not only get the best value for your money, but get the right one for the type of cooking/work/whatever you’ll be doing. My husband and I have been looking into outdoor gas grill options for cooking pizza for just over a year now. I have cooked on stone for years and just love the ease.. but don’t accidentally touch it while it’s hot! So quick question, would you say these work better for smaller personal size pizzas? Either way, it looks like the KettlePizza is less of a struggle all around to get the job done! Thanks for all the info! By the way, your girlfriend has the right idea with all of the olives. I could eat an olive pizza any day! I guess it depends on what you mean by “personal” LOL. Yes, a person can eat an entire one of the pizzas you make in this oven. However, they are quite a bit larger than the personal pan pizza’s you’d get from Pizza Hut. You could get pretty big, but then you run into issues of your peel being able to handle such a large pizza. So I guess I don’t “know” for sure, but haven’t tried to push the limits yet. Might be fun to experiment with! I have a Kettlepizza for the gas and charcoal. Although I have never tried the other product, I can say I love my KP’s! We are a family that is not good about careful storage and use of our toys and the KP is weathered abused. We do care for the stone but the charcoal one sits wherever we leave it. The materials are great quality and last forever. And easy to clean. 🙂 The heat trapping that it does and as hot as they get are perfect for backyard pizza parties. We love doing a “make your own pizza bar” and getting pizzas out in minutes. That’s very interesting to hear that you just leave your KettlePizza gas and charcoals both outside and they have stood up to weather conditions! I tend to be more careful with expensive items, but as you say, KettlePizza is legit, high quality material. My husband loves to grill outside and has always wanted a brick oven, but as you mentioned, they are expensive. It’s good to know there is an alternative and after reading your in-depth review and watching the vidoes, I think I prefer the KettlePizza too. I like the temperature gauge, the fast heating, the easy setup, cleanup, and storing. Maybe the price is higher than the BakerStone, but I would rather buy what I think is the better quality to avoid disappointments. Do they only come in gas, can you get one for charcoal? I love pizza! It is one of my faves! Both of your reviews are awesome. It is really hard to choose either or but I prefer a pizza that is burn free lol. So I am going to have to go with the Bakerstone. The main reason is because you have burned less pizza with it. I really was going for the KettlePizza though. Thanks for the review. After reading your reviews on both and taking a look at the plethora of pictures/videos you’ve provided, I’d say I’d have to go with the KettlePizza. I like that you have more control. You have the grill, pizza stone, and cover to manipulate if need be. With the BakerStone you’re kinda just stuck with what ya got. Informative AND entertaining! Love it! Thanks for rubbing in your lucky California climate. I’m in Chicago where grilling in the winter is a chore even if I pull my grill right up outside my door. That being said, I have an egg, one of the smaller ones. While both of these setups look great, when I compare the dimensions to the size of my grill there’s no way either one would fit inside of it. Sad days for me. Do you have any recommendation on a stone/setup that might fit inside a 13 inch diameter grill instead? Clearly I’d be making smaller pizzas than you are today. If nothing specific comes to mind in that size profile, are there any particular recommendations on a stone setup for my indoor oven which is more traditional in regards to size/space? We live in California, too and we love our outdoor brick oven for when our family gets together and has pizza night. The bakerstone looks like a good addition to our needs, however, maybe a bit too much assembly. Your site offers much-needed information for our families pizza making needs. It isn’t always we can cook outside so buying something for the inside of our home will be in order. I have never seen pizza making on a grill before, I have only done it in the kitchen. Your website is very informative and your photos are very nice. I got hungry when I watched your videoes. The KETTLEPIZZA cooks easily but seems difficult to use. Great review of two products that both look pretty good. My two favorite things though, apart from all the great info you provide of course, are 1. that your girlfriend loves olives as much as I do (I so wish more pizza places would put more olives on) and 2. that your dogs were in the video of you making the KettlePizza! They so look like they are hoping something will fall off the counter!! Anyway, after reading your mini reviews I think the KettlePizza sounds great, as for me the ability to clean it would be one of the primary factors. Did you notice any difference in taste between the two pizzza ovens? 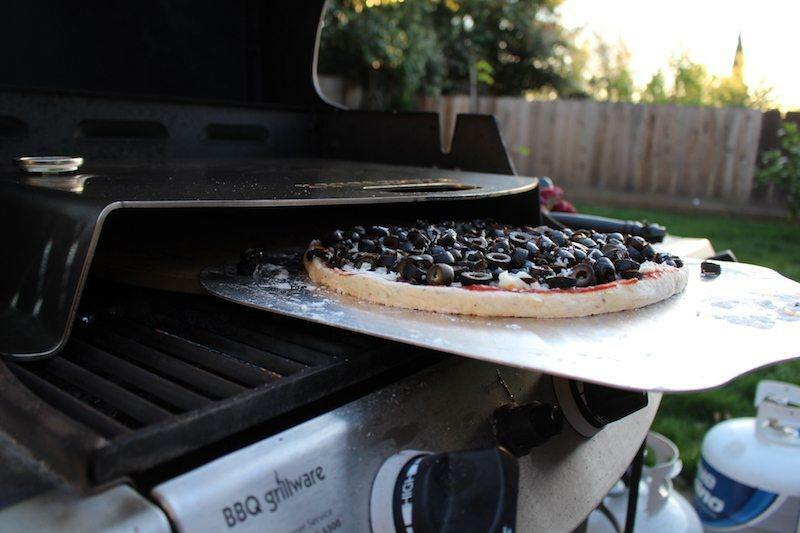 It’s amazing to think someone came up with such a great idea of using a grill to cook a pizza! Got to tell you, I’m loving the whole idea of cooking my own pizza on my grill! I have actually never heard of this until now, thanks to you! Me and my girlfriend love pizza and can eat it multiple times in 1 week. And now, if I purchase one of these, I can make it exactly the way I like it! So glad I ran across your article. Very informative!! Hey, thanks for putting in the time to write a really detailed review on the difference between baker stone and KettlePizza. I love outdoor cooking and entertaining, and barbequing. Match that with Pizza and it’s a perfect match! So we’ve been trying to decide which option was better, and you’ve definitely helped us make our decision. Baker Stone is the one for us! I think it will be worth it for better quality pizzas and longevity of the product. Never knew there is such a thing as pizza oven box (!?) that we can place inside the BBQ grill. Your grill looks as large as ours so this thing would work in our grill too. It’s helpful to know that they heat up to 400-500 degree in as quickly as 20 min in cold weather as I live in the Pacific Northwest. I prefer making pizza on a thin crust so KettlePizza might be a good choice for me. Thanks for such a detailed comparison between these two pizza oven boxes. I’ve added both of them to my wishlist at Amazon! Wow, This is just the article I needed to see! Not in a hundred years would I have considered baking a pizza in the barbeque. Especially not well. those photos look amazing. I live in Canada, so when barbeque season hits it hits hard lol. Its a pretty amazing time of year when “the freeze” dissipates and suddenly everybody is on their patio barbequing. However nobody that I know is baking pizzas. Appreciate the info, I think I can deal with a bit of a clean up and assembly, that baker stone looks amazing to me. Wow, combining my two favourites types of food: pizza and BBQ! Ok, not the BBQ taste but the method of cooking – you know what I mean! How long did it take to cook using each of them? I know you said the KettlePizza was faster but what about average cooking times? I wouldn’t want to wait for too long! That would be a key factor in choosing between the two for me. I didn’t see this post prior to my purchase of the Kettle Pizza. After reading it, I decided that I would stick to the Kettle Pizza. I appreciate the way you did the side by side comparison, you don’t see that often. As I am writing this I am thinking about giving the Bakerstone as a gift. It looks like a more sturdy product and would be the perfect gift for my brother. Very interesting and detailed review. 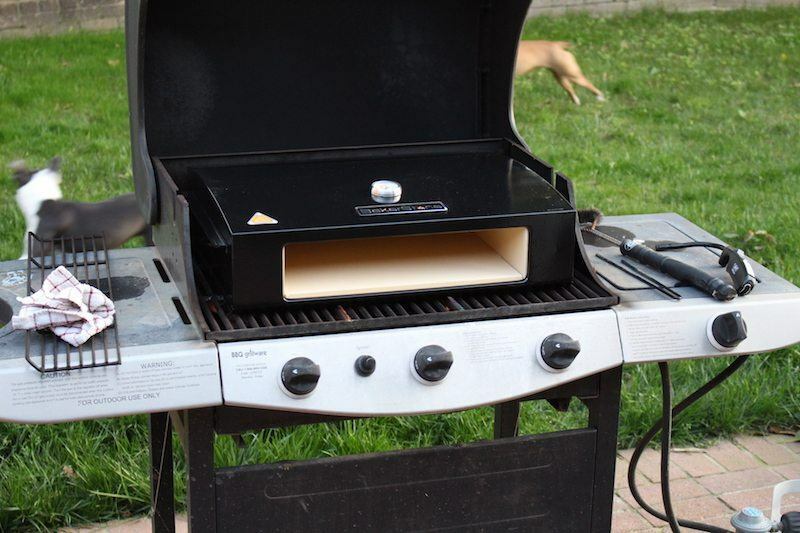 I’ve been searching for an outdoor gas grill cause I’d love to cook pizza myself whenever I want. I never used a gas grill before though. I would go for KettlePizza because it’s faster even if more expensive. Love olives too but I prefer them green. Thanks for the review. 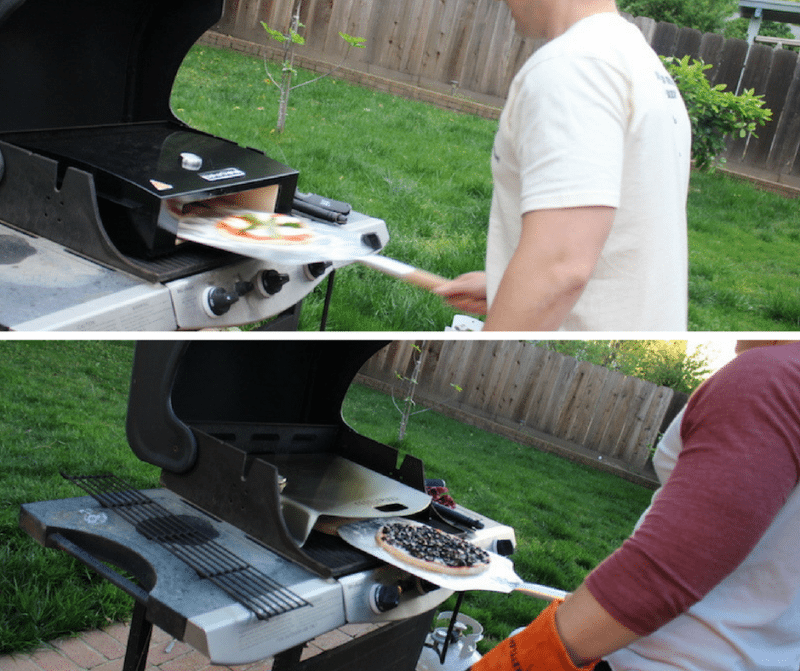 Great reviews on both of the pizza making adaptions you can buy for the grill. We’ve been looking to buy a grill because summer is really coming up fast. Those adaptions look clever and very affordable. 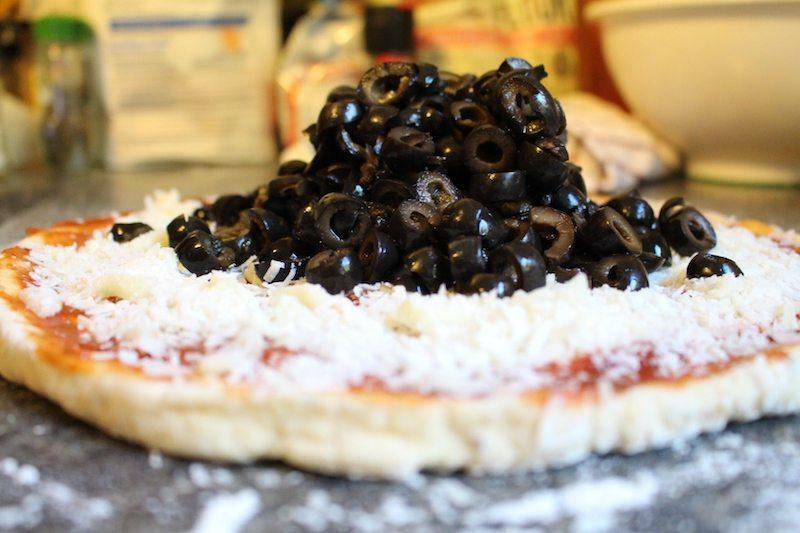 Just for the record, I love olives too, so that pizza that was loaded with olives looks delicious. I’m bookmarking this site for later use, thank you. hey nate. Your site is perfect from what i can see or maybe it’s because i love pizza lol but the content is great and there are necessary advertisements such as pizza hut and also mouth-watering images! I know this site is or will be a success! The comparisons were also very good, i think i prefer baker stone. I think I would personally go with the BakerStone. Maybe because I like the design a little better but also because it is a bit bigger and even though it does take a little longer to cook pizza I think this would go perfect with the grill I have! It is great to know that there is options out there! Both pizza accessories seem pretty cool. I agree, it is a close call, just reading about the two. Based on your review, I think I would also prefer the KettlePizza. The pictures of the pizza you made look more appetizing from the BakerStone to me though.Perhaps that’s due to toppings. Curious, would you still want a brick oven after using these devices? Wow, what a huge waste of time and effort using a lame gas grill. LOL The whole point of using an outdoor grill to bake a pizza is to get a nice wood smoke flavor in the pizza! I have been making pizzas right on the grill for years, with my charcoal smoker/cooker. But if you’re a newb to this method, both of these products are good. There’s also the PizzaQue which gets great reviews and is a darn good price. Notice even the manufacturers don’t use a silly, tasteless gas grill in their demos. LOL. One, I removed your affiliate link. Two, I don’t apprecaite the attitude Gary. Three, the point of using a gas grill is that some people don’t have charcoal, and it’s actually easier to maintain the temperature in my experience. It’s not for everyone, for sure, but it’s still a lot of fun and easier to run that with charcoal/wood. This would be a great activity with the kids, and there’s less mess to clean up at the end. I’m working on testing the PizzaQue soon, but in the meantime you can see my review of the KettlePizza Charcoal, which was the original device I believe. I now need a pizza! Those pizzas you make look fantastic, doesn’t matter which method or cooker you use, they look yummy! I am a hands on grill type person and needing to rotate the pizza a few times does not worry me. But the main reason I prefer the KettlePizza Gas is the ease of setup and the ability to easily clean or replace the pizza stones. Price does concern me but the value of the product which you have pointed out will outweigh the extra expense for me. Thankyou for the great comparison of these products, I am now able to go out and buy what I need – you have saved me heaps of time. Yes, you’ll be able to use these every summer for the next couple decades, so the value vs price increases with time. Great Review, not sure what’s happening with Baker Stone these days, seems they may be losing their steam. I’ve been making my own pizza on the grill for a year or so now, Friday night is pizza night for my wife, twin 13 yr old girls, and myself. Nothing to raise the temp, just the grill and a stone. I really think one of these products will enhance the experience. I’ve been making my own dough and sauce for most of that time. I still experiment with dough occasionally, but have settled on a sauce that all of us like. FYI, use corn meal instead of flour on your peel. The cornmeal acts like ball bearings and your pizza will slide effortlessly onto the stone. Ha. Since I wrote this review I figured out that cornmeal instead of flour helps, and also I need to use a wooden peel to make the pizza. The dough sticks too much to the metal. I’ll bet the pizza on a plain BBQ tastes fine. Pizza is hard to mess up! But I do agree that having a special pizza-bbq tool will certainly make things more fun, and more an an event for the family.